Men watching sports on TV is serious. Serious fun that is. 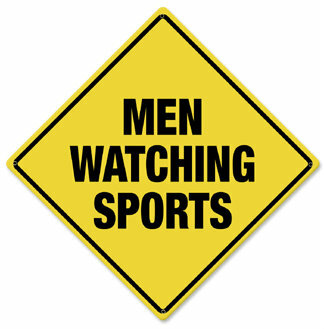 This Men Watching Sports Sign gets the point across to those who enter a Man Cave or other room that has this sign on the wall. This quality Men Watching Sports Caution Metal Sign is durable, has a yellow background with black writing, has a long lasting finish and is approximately 12 in. x 12 in. It is drilled and riveted for easy hanging and hangs diagonally. Proudly hand made in the USA, this sign is about 1lb. and is made of heavy 24-gauge American steel. Therefore, this is NOT a tin sign. ON CLEARANCE A Man Cave Gifts Exclusive!